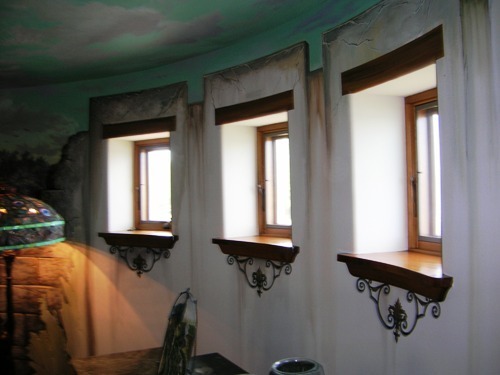 Trompe L'oeil effects with wrought iron details painted under each window opening. 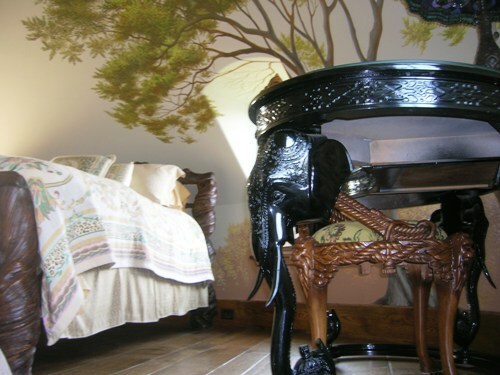 Turret bedroom known as the "Safari Bedroom"
Clients provided theme while allowing artistic license to create lively environment - ( now one of the more popular rooms for guests). 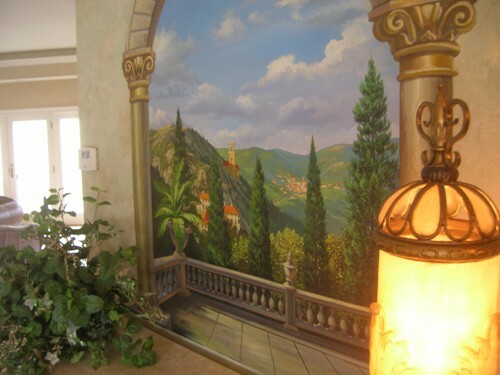 Tuscany theme for dining area. 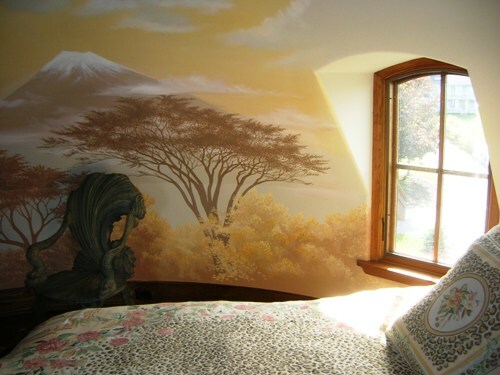 Landscape painted on canvas and "broken plaster" effects and vines painted directly on wall surface. 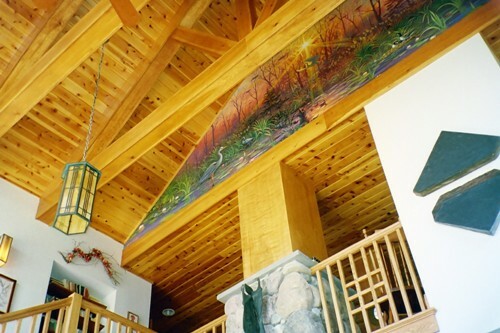 Triangular Painting - acrylics on canvas sections - 20' x 8' for top of cathedral ceiling for estate on Lake Ontario. 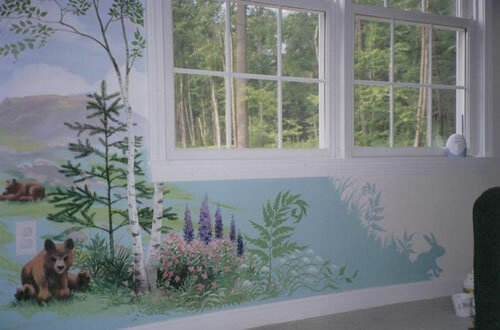 Pull back view of mural installed in 30' living room overlooking Lake Ontario shoreline. 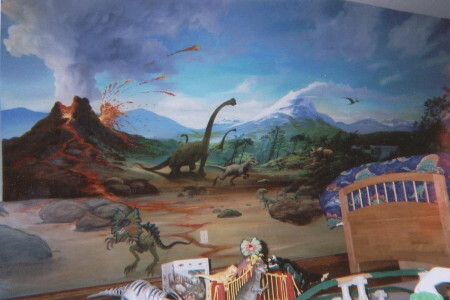 18' acrylics on wall and canvas section for children's bedroom. 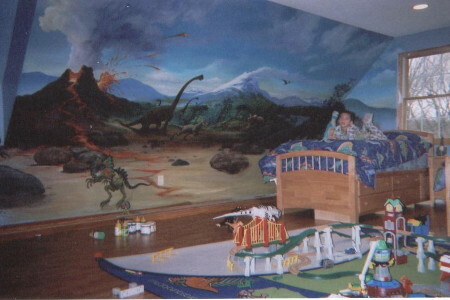 The client had asked to have wall mural of ancient times to compliment their son's vast collection of dinosaurs. 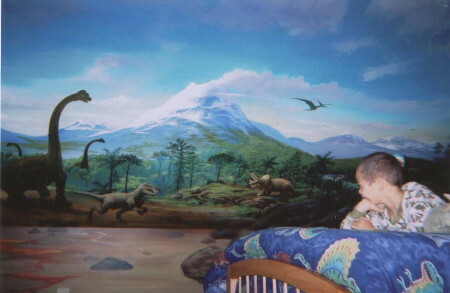 The idea was to create a virtual "Jurassic Park" for their sons' room. 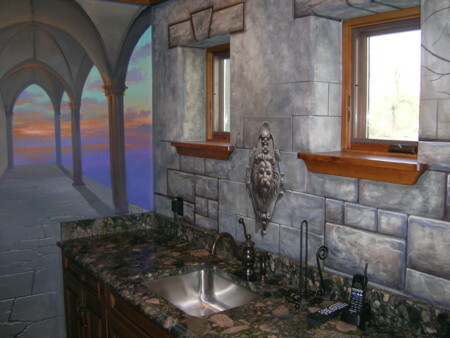 Located across from Boldt Castle Yacht House on the St. Lawrence River, this castle styled home incorporates trompe l'oeil effects of broken plaster, creeping wisteria vines, stone block masonry and more. 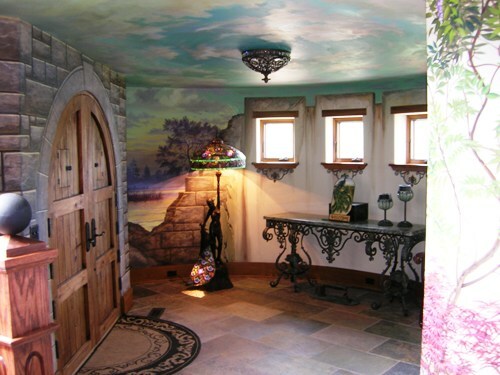 The "Grotto Room" - lower level - trompe l'eoil stone block effects painted directly on wall surface. 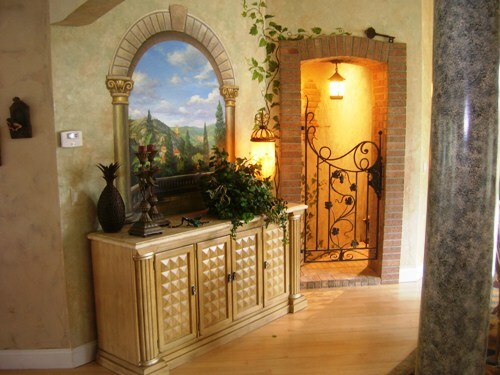 Main entryway doors. 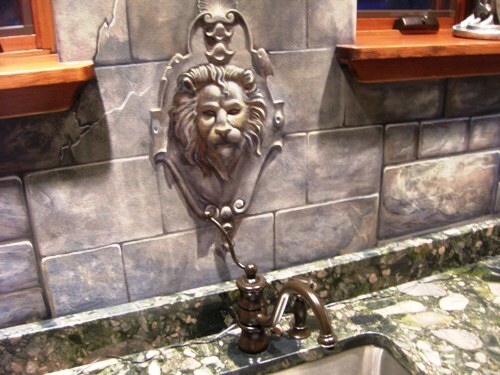 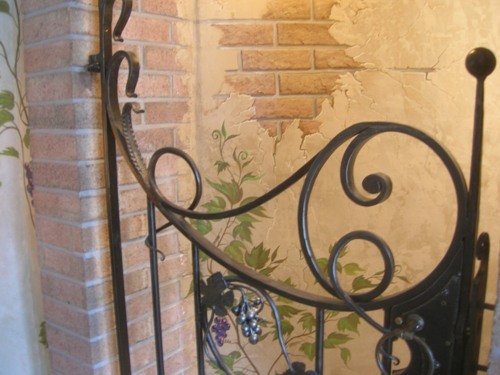 Hand-painted on walls - stone block effects with "breaks" in plaster to open interior space. 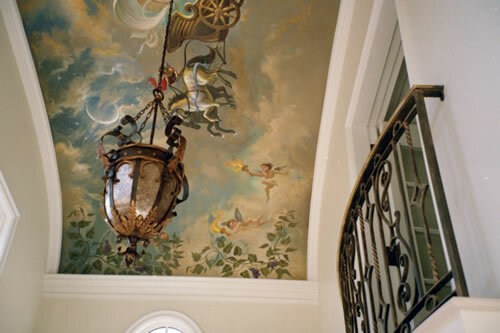 Ceiling effect - main entry - attempt to create more space by a "sky" effect beyond the turret shape of the foyer. 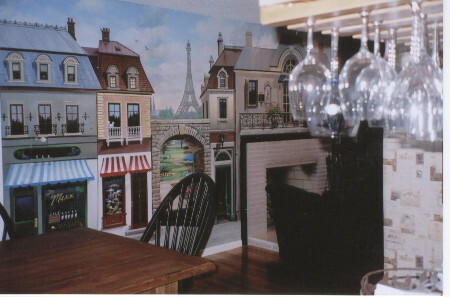 Cityscape view for dining area of residence. 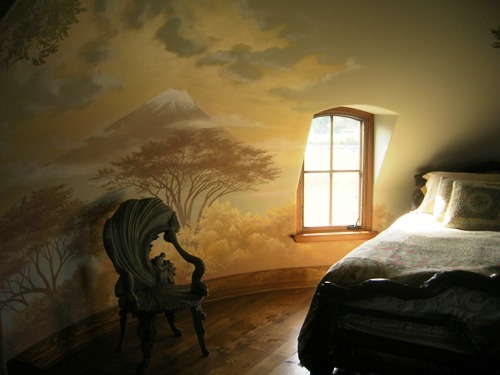 In this wonderfully restored limestone upstate New York farmhouse's master bedroom, trompe l'oeil artwork was created over a loft / 2 story window. 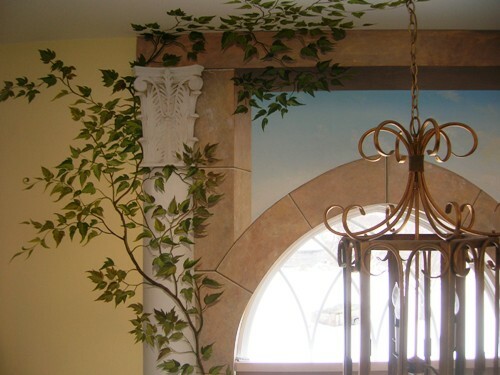 Vines and stone block and columns were painted to encompass 2'' thick relief corinthian capitals. 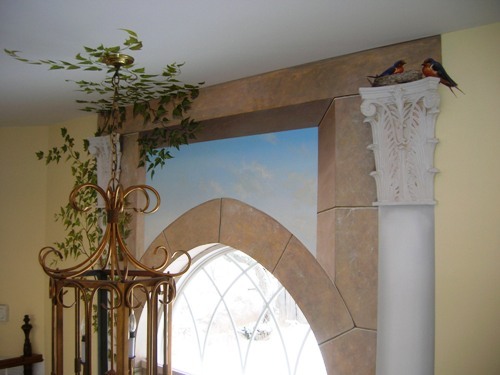 Birds (barn swallows) added in nest above column. 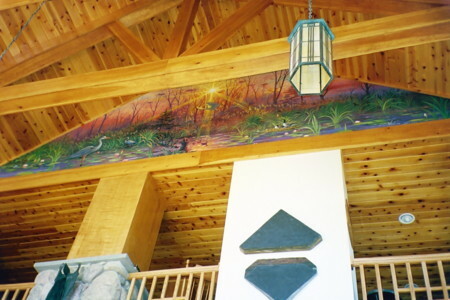 Detail - mural painted on five canvas sections and installed 40' up on triangular surface. 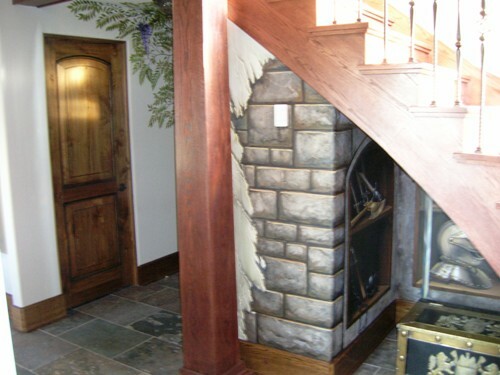 Taking a secondary wall area and bringing it to life. 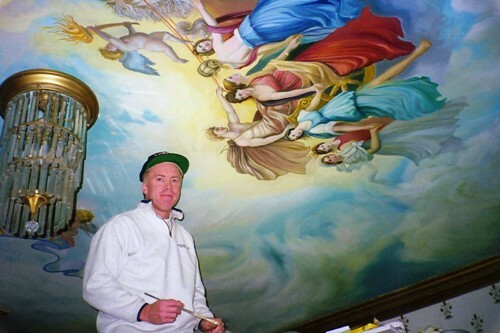 (Artist wishes he were smiling). 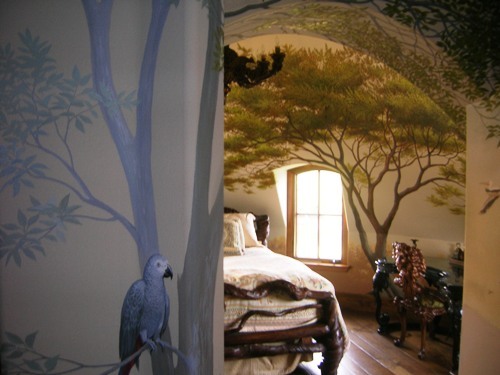 Canvas wall covering before artwork is completed - installed with adhesive and assistants on scaffolding. 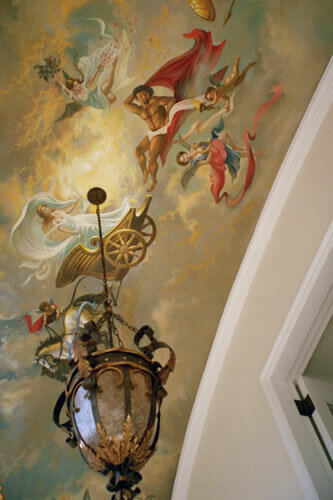 Client wanted a classical themed artwork for the 22' high ceiling in their Cape Cod estate. 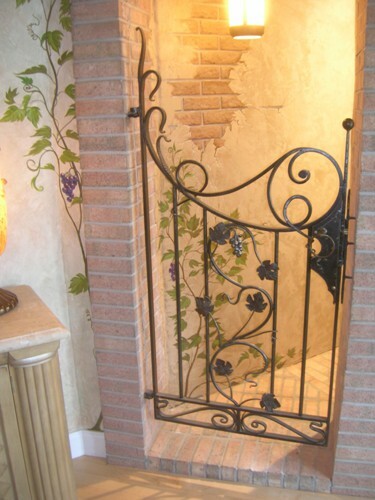 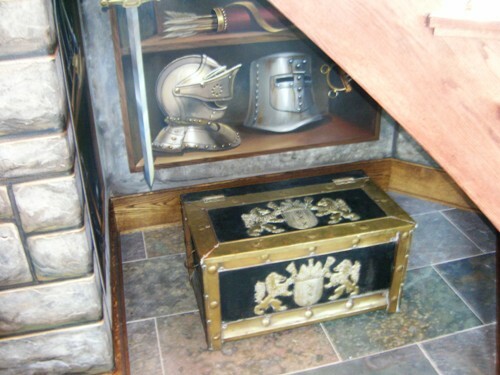 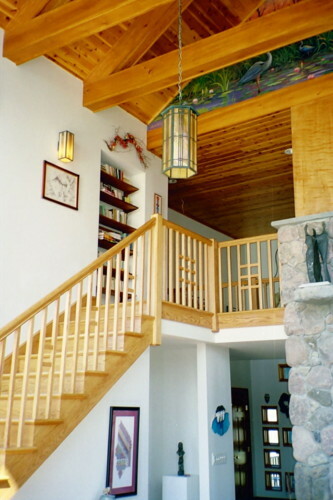 Client had space below stairway - since it is a castled styled retreat, a weapons storage idea seemed to fit the space. 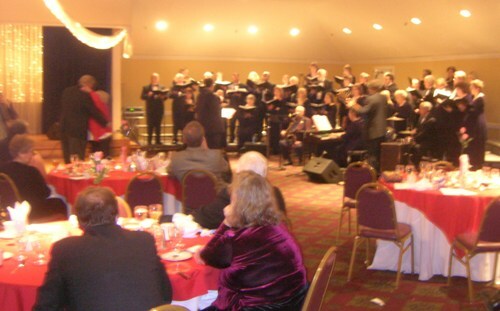 Evening gala - Chorus Performance before Silent Auction results are announced. 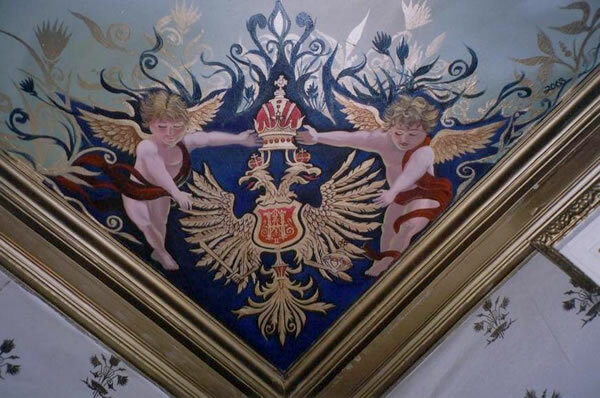 Corner motif with angels balancing on either side of Russian Monarchy emblem ( client's desired element)Painted separately on canvas section - cut out with irregular edges and blended in swirling botanicals to erase /cover edges. 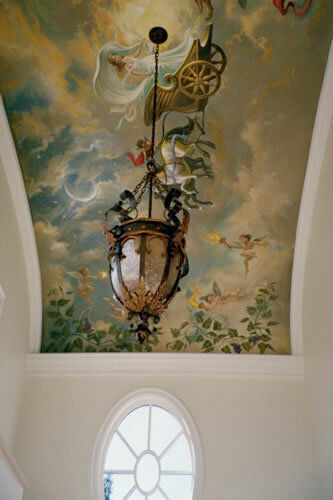 11' high ceilings in the music room. 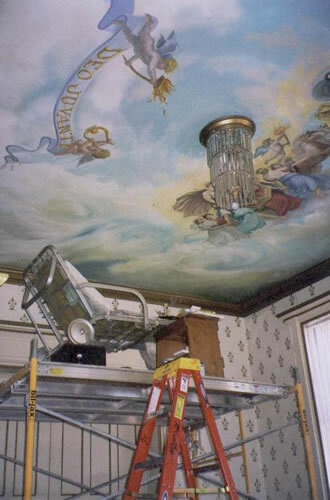 Scaffolding employed with aluminum recliner set upon and achored to five packing crates in order to reach work surface. 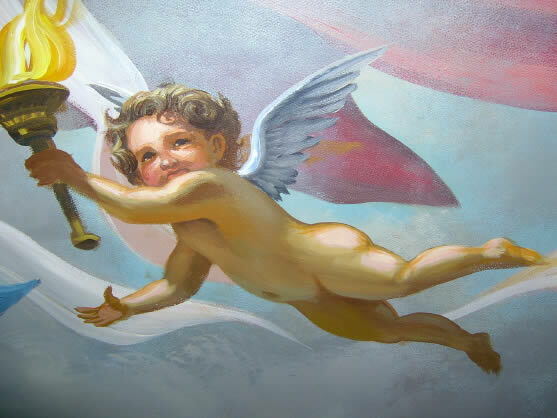 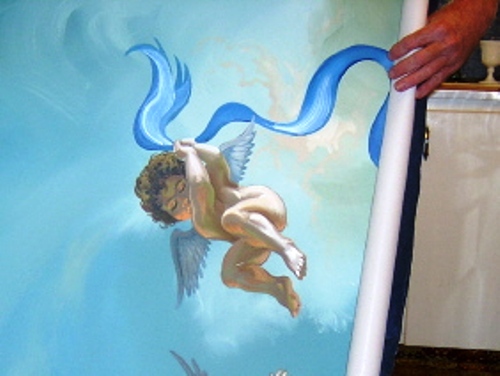 Detail of angel from 20' x 8' classical mural painted for client in North Flamouth, Massachusetts. 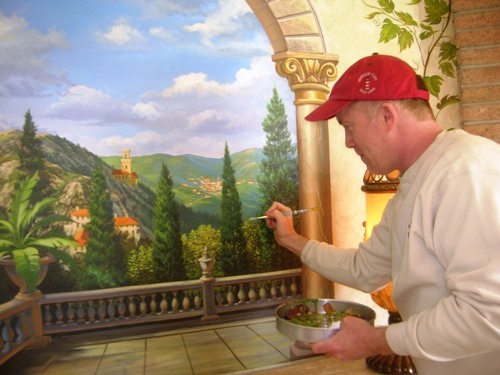 (acrylics) Emphasis is on natural lighting and realistic style for old world look. 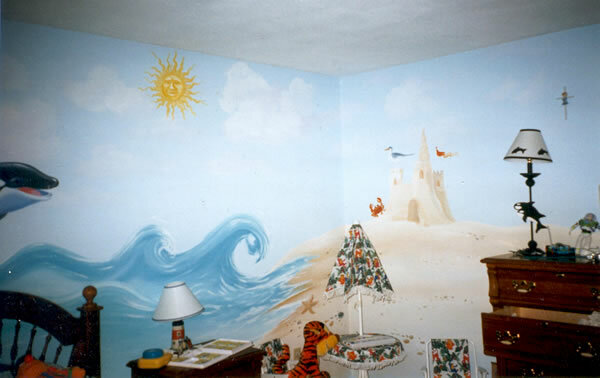 Oils on canvas 24" x 36"
Sand castle/beach theme for children's room. 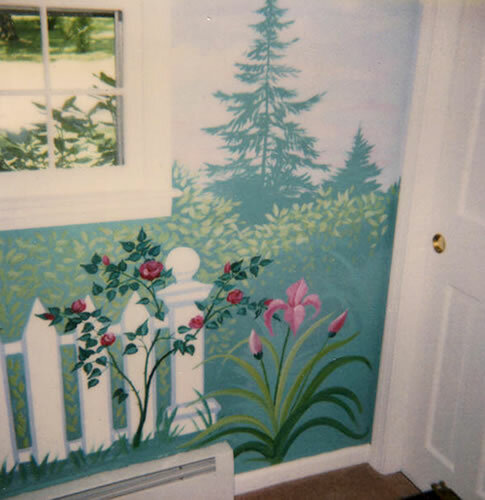 Acrylics and latex paint on wall. 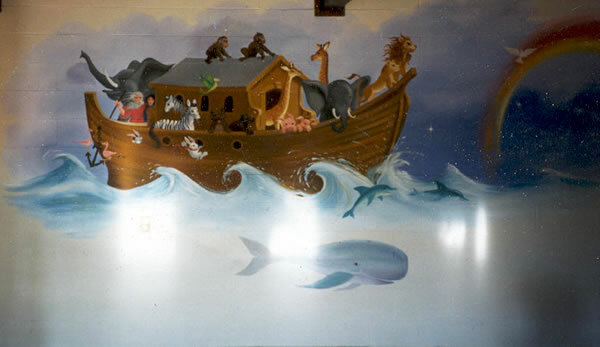 Acrylics - The goal was to liven up a spare looking recreation center. 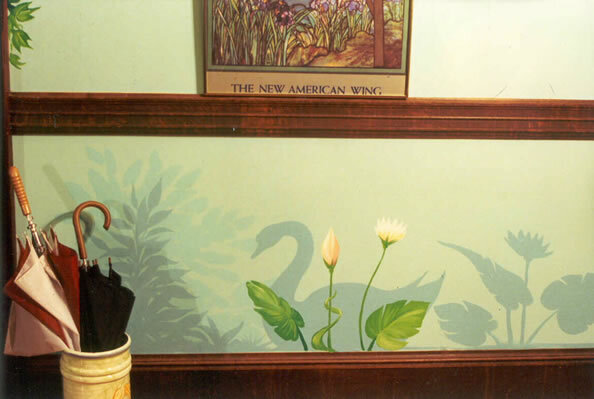 Acrylics on wall space. 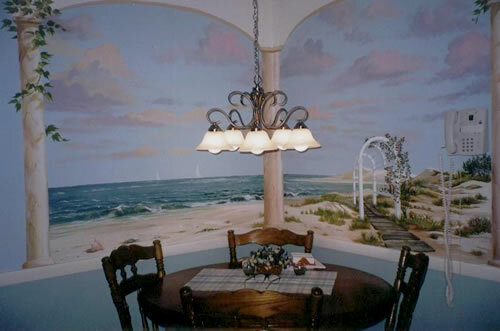 Kitchen table area transformed from blank walls to Cape Cod view. 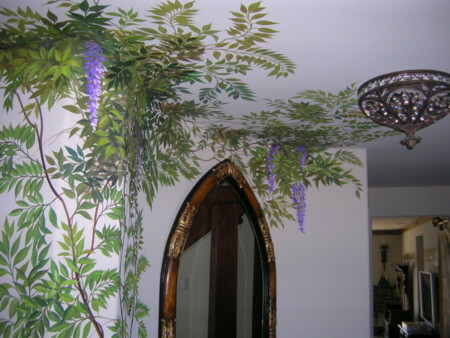 Architectural elements (columns) vines, arbor and archways to lead viewer's eyes outward and to distract from the wall mounted phone. 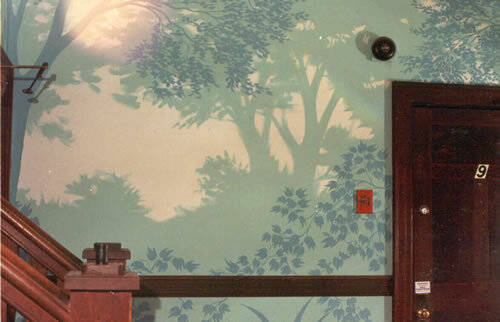 Designer Showhouse - McDuffy School - Springfield, Mass. 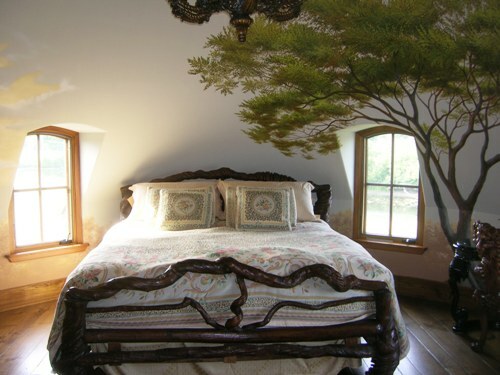 silhouettes of trees and vines painted in one-two tones punctuated by full scall realistic plants intermitently spaced. 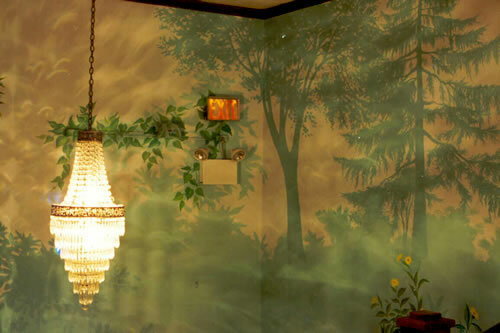 McDuffy Designer Showhouse foyer project - acrylics on wall space - forest shadows...........very effective outcome. 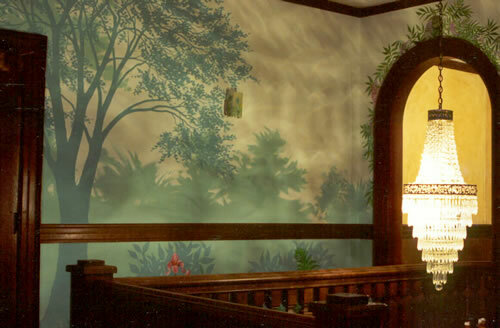 McDuffy School Designer Showhouse - Springfield, Mass. 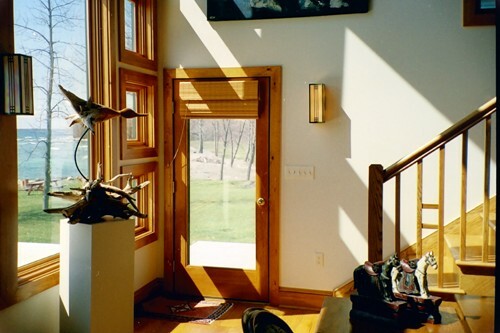 early 1990's Contrasting light wall treatment against heavy dark woodwork. 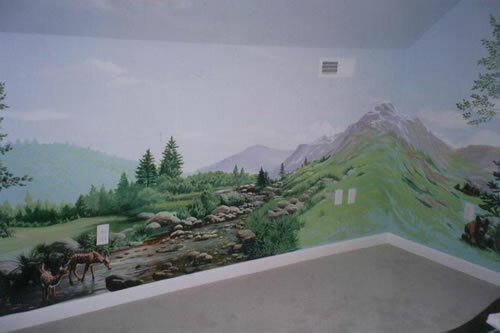 Bedroom project for young client. 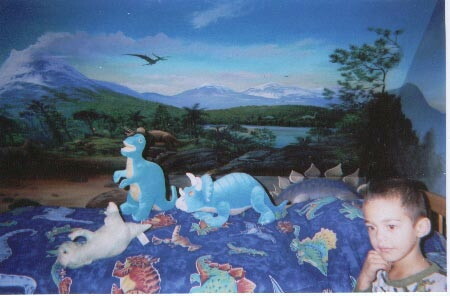 Garden theme for her stuffed animal collection. 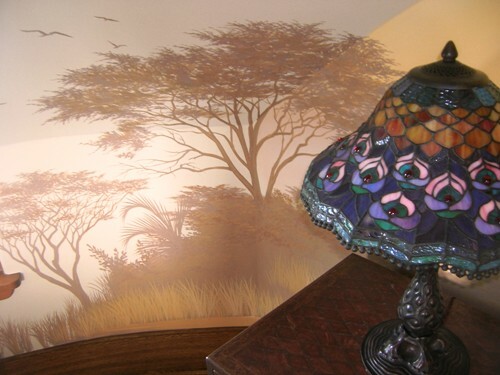 Corner detail of wall mural. 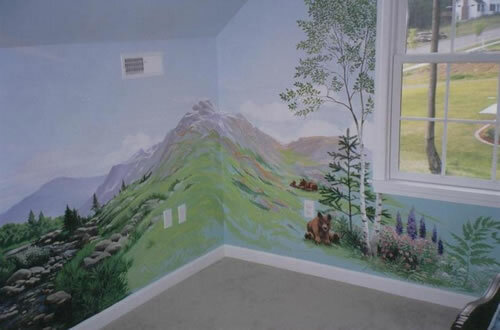 Client wished painted artwork verses wall paper for her child's room. 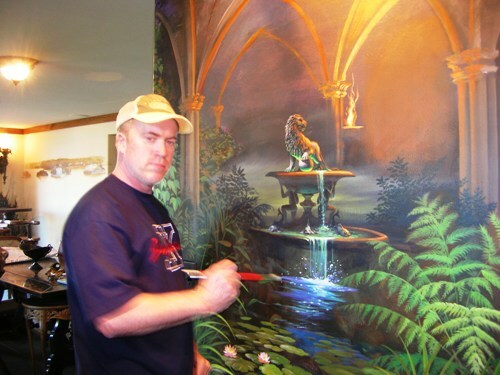 22' x 8' classic mural depicting ancient mythological story of the Moon Goddess Selene and the mortal Endymion. 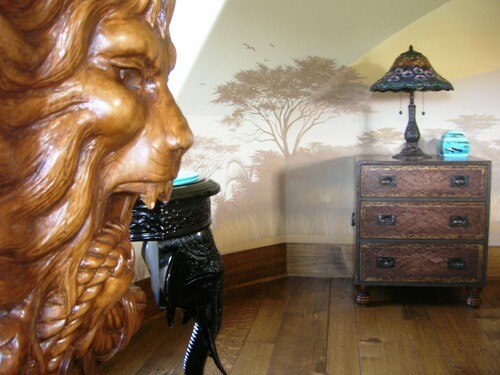 Painted in acrylics on canvas wallcovering with a glaze applied for an antique look. 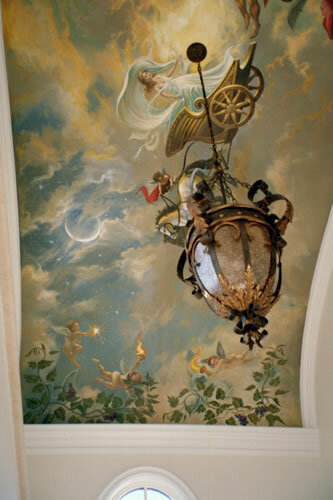 Baroque light fixture (heavy) centrally located on ceiling mural - image painted around where connection would occur. 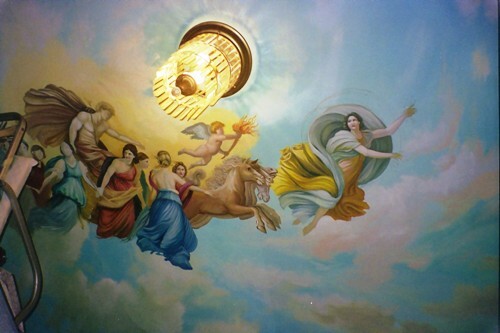 Upward view of ceiling mural depicting the story of early classic mythology. 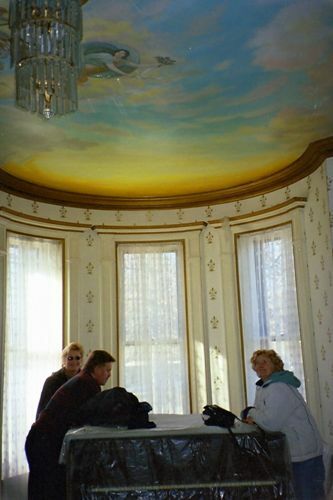 Northern view of ceiling mural. 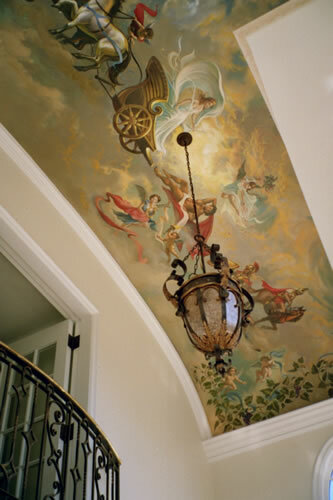 15' high scaffolding on wheels with three assistants required for successful installation of artwork in confined foyer. 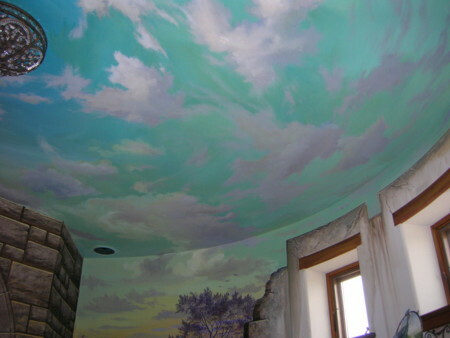 Curved ceiling required many hands for canvas application. 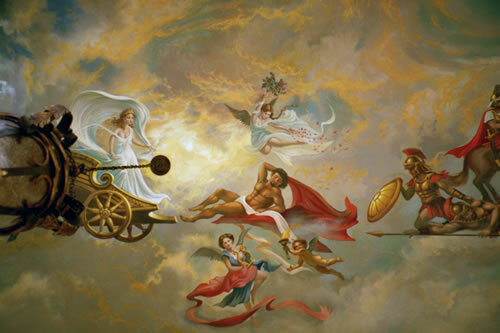 After having upwards of fifty offspring with her mortal lover - Endymion, Selene, the goddess of the moon, faced a dilemma. 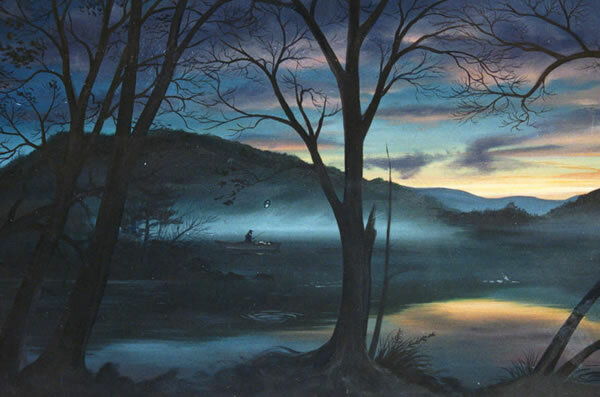 She could not bear the fact that her handsome companion would eventually grow old and die - thus leaving her alone. 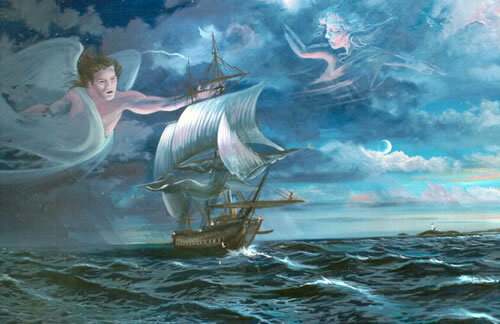 So she cast a spell on him to place him in a perpetual sleep - never to wake forever retaining his youth.